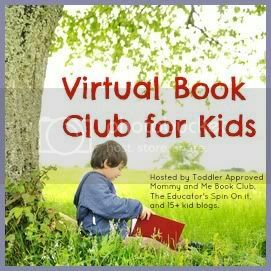 Each month we spotlight a new author for Virtual Book Club for Kids. This month we are featuring books by David Shannon. We have several favorite David Shannon books, but decided to get a new one for this month's book club. We thought David Goes To School would be a fun book to read together as my son gets ready to start kindergarten next year. David Goes To School is a silly book filled with things that David does at school... that he probably shouldn't be doing- chewing gum, throwing paper airplanes, drawing on desks, etc. Kids love reading about all the things they know they aren't supposed to do and this book is a fun one to read as you talk about how you are supposed to behave in school. While we read David Goes to School we came up with three crafts and activities inspired by the book that we are excited to share with you! The second my son saw the cover of this book he wanted to make paper airplanes like David did!! We've made some straw airplanes before, but it has been awhile since we have made actual paper airplanes. 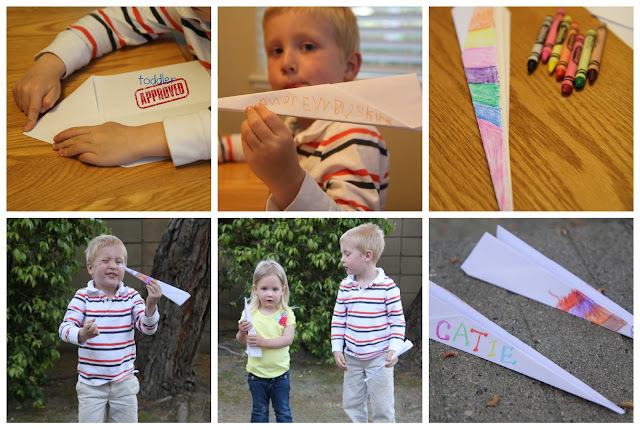 We tried out the How to Make the Very Best Paper Airplane tutorial over at Creative with Kids and our kiddos were very pleased with how they turned out. I made my toddler's airplane and decorated it for her since she's under the weather and didn't feel like doing anything. Once she saw it she had to go fly it... success! My 5 year old tried really hard to make his airplane by himself, but needed some help pressing down the fold lines. His favorite part of decorating his plane was writing his full name! For our next activity we pulled out a bunch of gum. Instead of chewing it, we decided to play and sculpt with it! We were pretty positive that David would have enjoyed this sort of activity! I made my name, my toddler made a snake, my husband built an "ant" (though my 5 year old told him it didn't really look like one), and then the 5 year old tried to make a Star Wars Death Star. I loved that this activity got the whole family involved. After we were done, we let the kids chew a clean piece of gum. I originally was worried they'd want to just eat the gum... but sculpting and playing with it actually ended up being fun enough that they didn't try to eat it. My son is drawn to rockets, so when he saw a rocket in the book on the page when David is daydreaming and looking out the window at the clouds... I knew we'd need to do some sort of rocket craft along with reading this book. 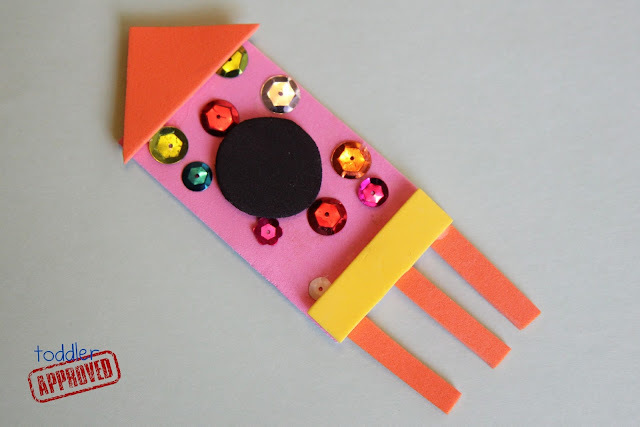 The rocket in the story is actually just in David's classroom... and isn't something that David talked about or played with, but sometimes our ideas are inspired by the artwork in the stories... not just the text. To make the rocket you need foam sheets (cut into rectangles circles, and triangles), tacky glue, sequins, and stickers. Now that we've shared our three ideas with you, do you have any favorite David Goes to School inspired activities that you've tried? What is your favorite David Shannon book? If you have blogged about it, we'd love for you to link up your post in the linky below! We can't wait to see all of your amazing ideas! 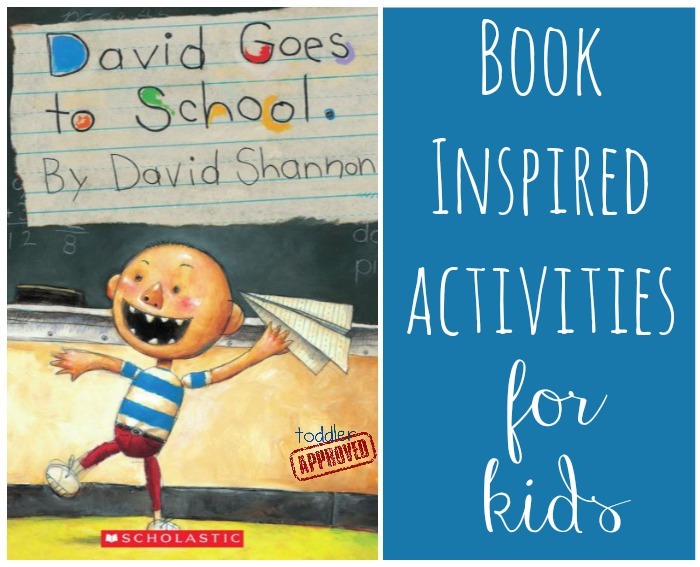 Link up only posts inspired by David Shannon that share children's book inspired crafts, activities, recipes, etc. Any other posts will be deleted. Reminder: Did you enter our awesome children's book giveaway yet? 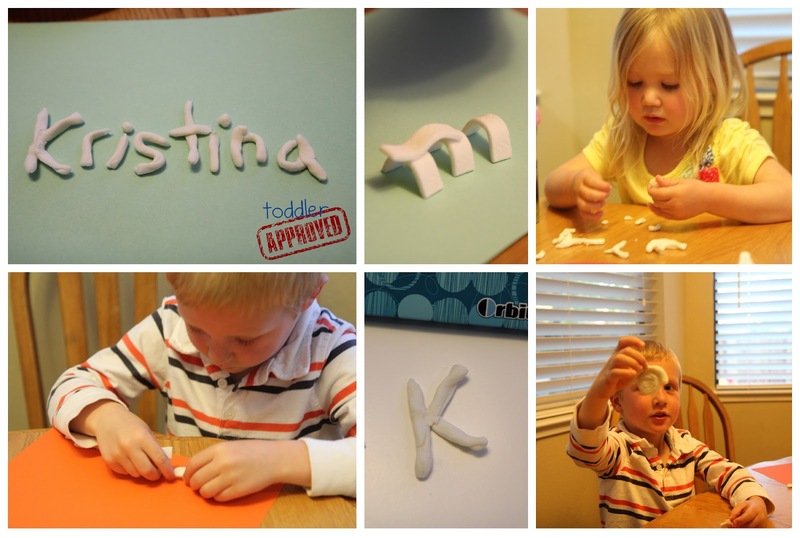 I love the activities you did to go along with this book, especially playing with gum! I bet that was an interesting sensory experience. Wow! What a great selection of activities! Love the gum idea. Super cute!! I love the rockets and playing with gum activities. What a great time of year to get outside and fly paper airplanes. Love the gum sculpting, how fun! Super cool rocket! We will have to create it during my daughter's astronomy unit study. Will there be an author featured for May? Thanks a bunch.